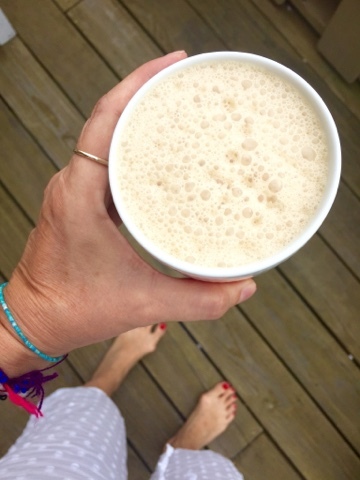 I was introduced to the most delicious coffee from my healthy friend Rebecca who lives on Martha's Vinyard and teaches yoga there (link below). It has now become an obsession with me and I can't wait for my morning coffee! When I need some healthy 'friend-wisdom' I talk to Rebecca, everyone needs a friend in their life like Rebecca, my sister and our extended macrobiotic friends are always a great help too. I asked Rebecca to break it down for me, this new coconut oil/coffee contraption that I have fallen in love with and this is her FULL unfolding why this coffee is not only delicious but better too! Coconut** meat, butter and oil is a medium-chain triglyceride (MCT oil) which is easily used for sustained energy by the body (unlike longer chain fats that take a lot of digesting, and are harder on the liver to process). Choosing to have a healthy, clean (no chemicals) fat in the morning, especially if having a stimulant like coffee or cocoa (preferably organic, fair trade coffee and organic raw cacao--dark chocolate) is way better than no fats or no protein, or worse straight grain-based carbs in the morning, and/or low-fat or skim animal fats that are non-nutritive, and stressful on the body to try to function on. Coconut oil is also great to cleanse your skin in the morning and your internal system... It has naturally occurring Caprylic and lauric acid, which easily becomes monolauric acid a very effective and gentle anti-fungal which both helps rid the skin and body of non beneficial cellular inhabitants, like candida albucans and the clumping, strapping yeast bio-films that can wrap around our organs, or around undigested proteins. The coconut's protective oil also cleanses the coffee (beans) of inevitable molds that love to grow on nuts, seed pods and berries... They are delicious and nutritious that's why and how we grow on them too- nuts, seeds, berries are rich in anti-oxidants and protective phyto (plant) nutritives that naturally (through nature's wisdom) ward off potential infections that weaken their every cells' membranes and hence their bodies' chance of survival, driven by the soulful miraculous drive to live, express itself fully and aromatically and reproduce... (Just like us humans). Thing is molds, fungi, viruses, and bacteria also all want to survive and thrive and reproduce... And often their souls get off balance (with too much of a good thing, like sugar or polysaccharide over abundance and like humans they feed on this more is better energy and get ego driven or just gluttonous and take advantage of the off-balanced systems and eventually the etremism overtakes them, and they burst with a destructive force of enoughness...or spoilage... (Just like us humans)... But ya know nature has her way with us life-forms... And she keeps on keeping on, new forms, new energy will always arise and be born again to survive, thrive and reproduce before dying once again. I'm leaving that last part in there for you to chew on... I thought about taking it out but it was part of Rebecca's full unpacking and I just that well... heck... you might want to hear all that! Have a great morning and get on with your DAY!